Here’s a bit of family memorabilia that’s sure to raise some eyebrows. This hair wreath was given to me by my dad and my step-mother Doris a few months ago. They got it either from my grandmother Alice “Pat” (Waege) Rathkamp, or from my great-aunt Grace (Waege) Larson. My dad and Doris had this wreath displayed in their home for years. As a kid it kind of gave me the creeps. Now I recognize its beauty. 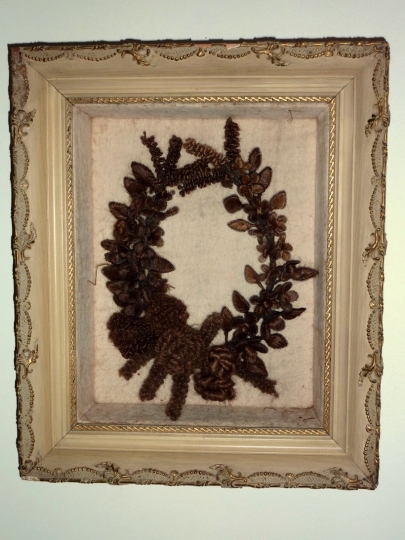 As much of an oddity as it may seem today, hair wreaths were popular during the Victorian era. Women often collected their own hair, hair of friends or relatives, or hair from the recently deceased. This hair was used to create everything from jewelry to toothpick holders. Hair wreaths were given as a token of friendship, or they could have been used as a sort of memorial to a family member. In the case of this particular wreath, it appears to have been made from the hair of several people because of its different shades of brown. There is an underlying tightly wound wire framework that the hair is fastened to and woven through. I’m guessing this frame would have been manufactured and then purchased? It’s impossible to tell for sure who made this particular wreath. This wreath was given to my dad along with some other pictures. 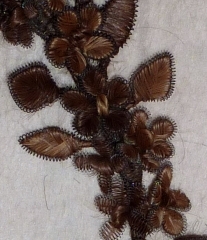 Based on the pictures that were part of this collection my guess is that it was made by my 2nd great grandmother, Paulina (Wesenberg) Brockhaus. 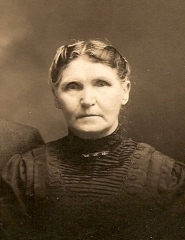 Paulna was Pat & Grace’s grandmother. Regardless of who made the wreath, it’s a bit surreal having an actual part of an ancestor hanging on my office wall. Stay tuned for next week’s blog post where I’ll talk about how my great grandfather made a couch out of an old wagon wheel and some hair from his beard.